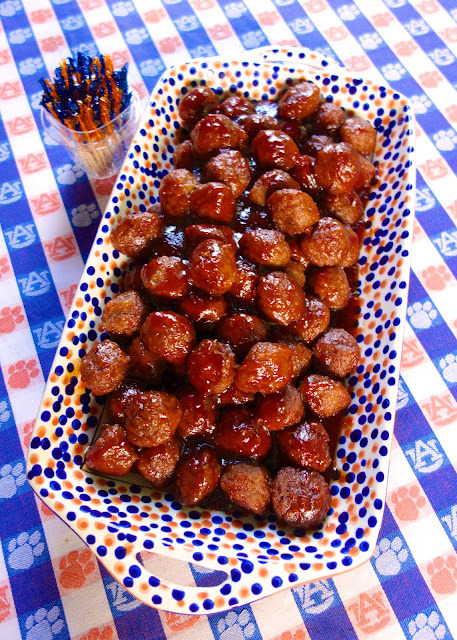 Grape Jelly Meatballs - only 3 ingredients!!! Can be made in the slow cooker - great for holiday parties! It's Championship Weekend in College Football! 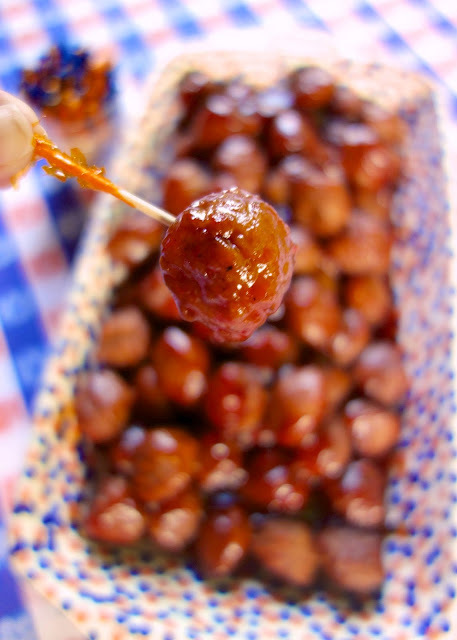 Are you looking for a simple snack for watching all the games? These meatballs are so simple and only 3 ingredients. All you have to do is mix everything up and simmer it on the stove for about 25 minutes. You could use a slow cooker if you wish. The slow cooker would be great for keeping the meatballs warm during any football and holiday parties. The first time I had these meatballs was several years ago at a Christmas party. I absolutely loved them! I could not stop eating them. I made Chicken Legs get some extra on his plate so I could eat extra without people noticing. I was shocked when I found out how they were made. I can promise you I would have never tried them if I had known they had grape jelly in them. Yuck! Who knew it would be SO good! In a large skillet or Dutch oven, combine all ingredients. Simmer 25-30 minutes, until meatballs are warmed through. You can also use the little cocktail smoked sausages.....DEEEEELISH! My mom used to make the lil smokies for holidays back in the 80's. I haven't had them in years. Yummy! My favorite way to do meatballs or little smokies. Yeah, these little suckers are addicting. Sweet baby Ray's BBQ sauce works well also. As an alternative to the Heinz sauce. Cut the jelly down to 6 oz. and add a can of jellied cranberry sauce and your taste buds will thank you! I'll try that next time - sounds good! My mother used to make meatballs very similar to these! Wow, I hadn't thought about those in a while. Instant craving! I remember having these at parties in the 1970s (Yikes! That long ago? LOL) The sauce is also very good to pour over a meatloaf and bake. I haven't had these in years! We did the grape jelly with Heinz Chile sauce and with Sweet Baby Rays. Also added some hot pepper jelly to it like Lynn Huntley does. Gives a nice zing to some of the batches. Grape jelly and plain yellow mustard works great also. I hope the Auburn magic continues today. It did continue and we even got help from Michigan State! It has been an amazin season!! Am thinking about trying these and just happen to have frozen balls in my freezer although they are Italian style, did you ever use them in this recipe? My version is a little bit different as well. I use bbq sauce like a previous poster but some mustard along with it. Mine always go in the slow cooker but I have to have it in there for at least 8 hours even though they are frozen meatballs. Mainly because the longer they have been in the sauce cooking the better it taste in my opinion. By age 9 I was hooked on these little gems. I think I need a whole crock pot of these...like now! Yum! YUM! I will definitely try that! Is the cook time for thawed meatballs or still frozen? I used the meatballs still frozen. Hey, Stephanie! I plan to make these for our work tailgate tomorrow! I was planning on just bringing in my crockpot to plug in... would you sugeest 1-2 hours on high or low? Thank you! I would say 1 -2 hours on low. Enjoy!